As mentioned previously, my portfolio consists mostly of actively managed funds, purchased before I learnt that the fees for passive (tracker) funds were cheaper and that most active funds failed to beat trackers, despite being actively managed by ‘experts’. Apparently, some active funds have even been accused of being ‘closet trackers‘. Anyway, my passive / active fund split was 13% / 87% and I set myself a goal of making it at least 20% / 80% by the end of the year, with a view to ultimately switch most (though not all) of my funds from active to passive. What I hadn’t counted on was just how easy it would be for me to switch funds online (at no extra cost). So… I ended up ‘tinkering’ and making some adjustments to my portfolio earlier this week. As at today, my passive / active fund split is 42% / 58%! I switched 7 active funds (mostly UK equity) into existing index trackers or new trackers. One small fund I consolidated with another active fund. I didn’t sell any of the funds at a loss, gains ranged from 2% to 12%. I was going to aim for 80% / 20% but perhaps I’ll leave it as it is and will review in 5 years, and see what my tolerance for risk is at that point. Although if the market crashes before then (as ‘experts‘ keep predicting it will), then I’m likely to review a lot earlier! My portfolio’s also heavily loaded in the UK, which I’m going to redress that in the short term. Anyway, no more tinkering with or switching funds now. In terms of diversification, I’m missing Property so I’ll add that at some point. I’m also going to start investing in ETFs, but they’ll be mostly global ones. I’ll update at the end of the year to see how the portfolio looks. This entry was posted in Funds, Investment Trusts, Portfolio by weenie. Bookmark the permalink. It looks like you've been busy:-) Good work. I'm sure you feel better now you've set the bedrock for a better balance. 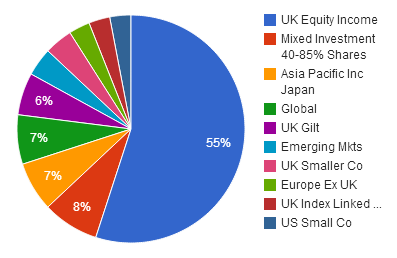 I have 56% in UK equities too and am itching to sort my portfolio out but my ISA still hasn't arrived in II. Grr!!. Plus I have to pay for trades (although some credit is included in the £20 quarterly fee) so I have to keep that in mind when making plans to buy and sell. Looking forward to seeing your updates.. Sorry to hear that your ISA transfer is still dragging its feet – hope that gets sorted soon! Thats a lot of funds! I've only got 3 in my S&S ISA at the moment, all Vanguard ones but I am thinking of adding a couple more. I can't decide which ones yet but I am thinking of UK smaller companies, emerging markets tracker fund and maybe even straying into active by getting in on the Woodford fund. Plus on property, wouldn't you include your buy-to-let property as part of your folder? Hi Mrs FF, I didn't plan on getting so many funds but went a bit mad going for diversification! Loosely, there are 10 different ones in my SIPP and S&S ISA. No, I don't include my BTL property in here as I see it as being in a different category of investing. If I need cash, I can just sell my funds. Not such an easy proposition with my property. I'm thinking of investing in a global property tracker for further diversification though. Good to see you back anyway! I just wanted to say how impressed I am with how you're investing. I just think back to when you started out and how nervous you were about it. Look at you now! Keep up the good work Weenie. I find it very motivating! Hi Huw, thanks for the kind words and encouragement! I'm a little more confident now, know a little bit more and look forward to growing my portfolio! buy enough active funds and you end up with an expensive tracker – that portfolio is crazy! keep reading hale then sort it out pronto..
Haha, thanks for stopping by! Yes it is crazy but it's actually an improvement since I switched out of another 8 active funds! I am still reading Hale and will shave off a few more later in the year. Still, at least it wasn't as bad as J Money's 47 fund/stock portfolio (http://www.budgetsaresexy.com/2014/06/lazy-one-fund-investing-strategy/) before he switched it all into a SINGLE fund! I'm not brave enough to do that!